Written in 1892. In The American Claimant (1896), 203. In Mark Twain and Brian Collins (ed. ), When in Doubt, Tell the Truth: and Other Quotations from Mark Twain (1996), 48. The great question. … is, shall we surrender to our surroundings, or shall we make our peace with nature and begin to make reparations for the damage we have done to our air, our land, our water? Restoring nature to its natural state is a cause beyond party and beyond factions. It has become a common cause of all the people of America. State of the Union Address (22 Jan 1970). To look backward for a while is to refresh the eye, to restore it, and to render it more fit for its prime function of looking forward. We have now felled forest enough everywhere, in many districts far too much. 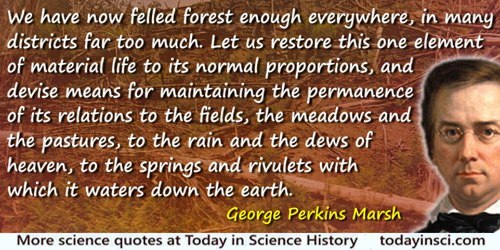 Let us restore this one element of material life to its normal proportions, and devise means for maintaining the permanence of its relations to the fields, the meadows and the pastures, to the rain and the dews of heaven, to the springs and rivulets with which it waters down the earth. From Man and Nature (1864), 328-329. We will build the roads and bridges, the electric grids and digital lines that feed our commerce and bind us together. We'll restore science to its rightful place, and wield technology's wonders to raise health care's quality and lower its cost. We will harness the sun and the winds and the soil to fuel our cars and run our factories. And we will transform our schools and colleges and universities to meet the demands of a new age. All this we can do. All this we will do.